In early October, my 16 year old nephew Liam Rissik and some fellow scouts from 1st Knysna Sea Scouts are doing THE RIDE to raise funds to buy one (or two if possible) bikes for the Knysna Sports School in the Western Cape, South Africa. It is a non profit organisation that relies on funding to operate, and helps disadvantaged children participate in sport and gives them the potential to improve their lives this way! THE RIDE is a repeat of the 245 km / 155 mile bicycle ride that Liam did in 2011 at the age of 12, to raise funds for his previous school’s science lab – I wrote a blog post about it back then https://traceyrissik.com/2011/04/our-big-bike-ride/ – Liam dreamed up the project of his own accord, and built his own bike with the help of a cousin living nearby, and did the 245 km ride with our cousin, in just 3 days!! My nephew Liam Rissik, on his 2011 fund-raising ride for his junior school. He did over 230km (150 miles) in just 3 days! He single-handedly raised over R15,000 (roughly £850 at today’s exchange rate) with the help of family, friends & admirers from South Africa, the UK and elsewhere. Local businesses helped by providing his cycling gear, eye wear, and various other items essential for such an adventure. PLEASE CAN YOU HELP THIS NEW PROJECT? F rom within South Africa: contact Karen on +27 82 344 0421 to arrange a donation. 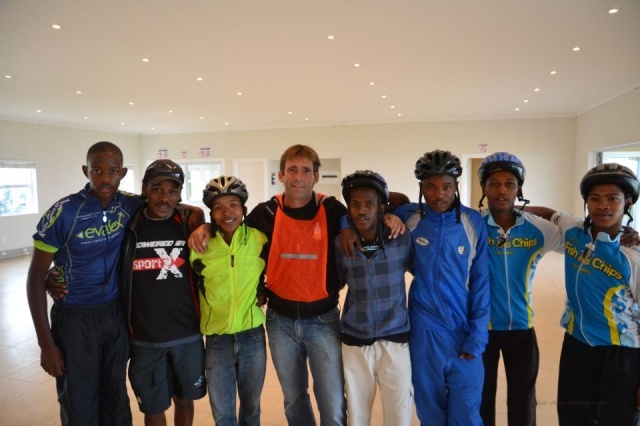 The Knysna Sports School aims to give disadvantaged children the opportunity to play a sport. Schools in the ‘township’ area of Knysna are visited and taught various disciplines. The kids who excel are then brought into a team culture at the school and further training and matches/races are organised. The school is an NPO run only on funding. The school develops young hockey and cricket players and has an active junior and senior cycling team. Golf, tennis, rugby and athletics are also being offered. They reach about 750 kids a month. This has seen many children achieve provincial level who would possibly not have had the opportunity to do so otherwise. Currently their bikes are very old and a lot of money goes into maintaining them. The older kids in the cycling team would really benefit from being able to ride new bikes. A reasonable bike will cost in the region of R5000 to R7000. That works out at between £300 and £380 each ….. roughly, at todays exchange rate. Any extra funds raised will go towards the running of the Knysna Scouts themselves. Please so dig deep with this – and feel free to share this post so that friends & family who would like to make a difference to disadvantaged childrens lives, can!